That form only accepted URLs which point to localhost. 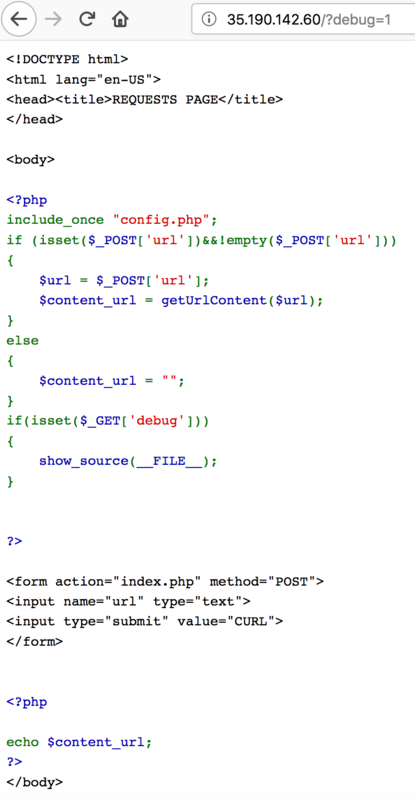 In the config.php file we find MySQL connection details and information that the flag is probably stored in the table ssrf.flag. We can send requests to MySQL by requesting http://127.0.0.1:3306/ but that is not very useful since we need to login and send a query over the MySQL binary protocol. Fortunately curl still supports the gopher protocol with which we can send requests to MySQL without any additional headers. Crafting the correct binary content is the hard part but that problem is also solved already. We’ve used this python script to create the payload. The author – Tarunkant – explained SSRF via gopher and his script very well here. But this script still requires the raw authentication packet. We’ve started a MySQL server and then connected to it via mysql -h 127.0.0.1 -u ssrf_user (login does not need to succeed). By the way, I gave the whole description of How to SSRF using gopher here(https://spyclub.tech/2018/ssrf-through-gopher/). And I hope you enjoyed using my tool. I’ve added also a link to your blogpost now.